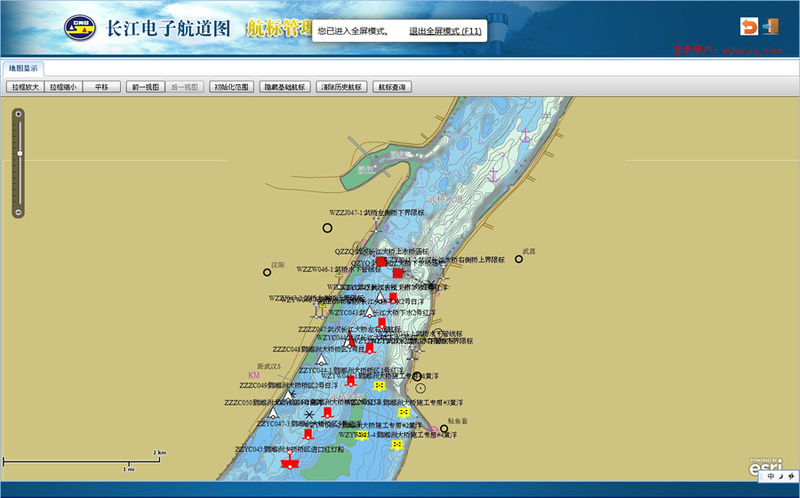 The Changjiang Waterway Bureau staff creates many electronic navigation charts to assist mariners. 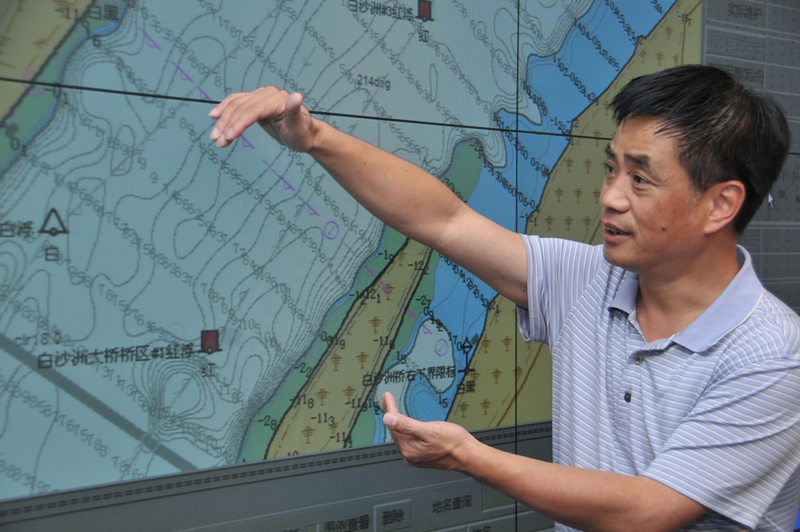 Commercial ships on China's 3,915-mile Changjiang River, better known worldwide as the Yangtze, increasingly use electronic navigation charts (ENCs) created with ArcGIS rather than paper charts to navigate the increasingly busy waterway. Since the river opened to foreign trade 30 years ago, shipping on the Changjiang has grown by leaps and bounds. In 2011, freight volume exceeded 1.6 billion tons, making the river one of the busiest in the world. The Changjiang Waterway Bureau, a part of China's Ministry of Transport, manages the river. The bureau is responsible for waterway planning, construction, management, conservation, and administration. The bureau's cartographers and chart makers use ArcGIS to create standardized ENCs. These charts are a vector database of the marine environment and include the shape of the coast: the river bottom, including depths; and the location of navigational aids, such as beacons and buoys, along the river. More than 10,000 people work in the bureau, many charting and mapping approximately 284 miles (58 kilometers) of the river. These are the portions that are highly navigable by large vessels and include an estimated 5,300 navigating marks, including buoys, poles, and lights, to help ships safely sail. Staff members are spread throughout 77 waterway management departments, ensuring that the data is collected as close to the source as possible, making it as accurate as possible. The enormous amounts of data that must be collected and edited to help vessels safely navigate the river required that the bureau find a better way to manage information. The staff chose ArcGIS because it was the only solution available that could handle the large volumes of data the waterway management departments submit to the bureau and distribute the information out as ENCs efficiently and quickly. Creating each navigational chart begins near the data that is being collected. Each local bureau creates and maintains its own data in its own projection using different types of software. This data, including both topographic and bathymetric data, is shared centrally with the main Changjiang bureau in both text and Microsoft Excel data formats. The data is imported into ArcGIS using a customized toolbar that the bureau created for its cartographers to transform local coordinates to a standard coordinate system. These coordinates ensure that all the data matches up correctly and can be used to map the river. Once in the standard coordinate system, the data is then input into an ArcGIS geodatabase. Bureau cartographers use ArcGIS to export maps and charts from one central database. The Changjiang Waterway Bureau has developed its own local ENC river chart standard based on the maritime industry's international standard. These standards are developed to ensure digital data can be transferred from one system to another without jeopardizing the integrity of the data. Since the ArcGIS data model is based on the industry standard, bureau staff can maintain the local data standard when it is stored in the geodatabase. "ArcGIS and its extensible data model, objects, and attributes make meeting Changjiang standard characteristics easy. This has paved the way for our ENC production," said Le Xu, the ENC production technical leader. Traditionally, each cartographer edits an entire map sheet on a desktop computer without being linked via a network to other computers. Once editing is complete, the sheet is exported individually. This operational workflow has quite a few shortcomings. Data being edited must be stored locally on the cartographer's computer. Not being connected on a network means the cartographers cannot interact. From a technical perspective, it is difficult to make individual map sheets match each other exactly once they are created. ArcGIS changes this traditional way of mapping by allowing cartographers to work together in a networked environment when editing maps. Working in a central geodatabase has also reduced the number of servers needed for storage. All the source data editing and modification are now centralized and shared over the internal network. The end result? The staff can export seamless maps from a single database. Having a centralized geodatabase has also improved the data's quality and the cartography. Inconsistencies that occurred when the maps and cells were edited individually have been significantly reduced. 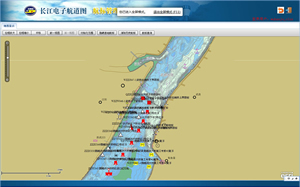 Using ArcGIS, the Changjiang Waterway Bureau charts approximately 5,300 navigation marks including beacons and buoys on the river. For complex editing, the bureau uses a more sophisticated workflow. Cartography in general is changing rapidly to accommodate users' increasing expectations. No longer is a single map produced on a paper sheet. Maps today combine information for analysis as well as spatial context. The Changjiang Waterway Bureau combines multiple scales for its maps. ArcGIS makes managing and editing these different scales manageable. When multiple datasets must be edited at the same time, the map tile or chart cell is first divided into continuous stream segments, or river reaches, in the main geodatabase. Then, each version is divided into different versions: contours and soundings, riverbanks, and other objects. The advantage to this workflow is the ability to modify the data without affecting another editor's edits. As ship traffic increases on the Changjiang River, so does the risk of accidents and economic losses due to vessels being unable to navigate the river to deliver goods. Ensuring water traffic safety on the Changjiang is essential to the river's health and the national economy. Creating one unified nautical information system helps China increase trade along its "golden waterway." "Implementing ArcGIS has improved our ability to create ENCs," said Shuo Xu, the ENC production team leader. "We have achieved multiple-scale maps and charts in a distributed environment, improving the efficiency and quality of our system." Learn more about how ArcGIS is used at nautical organizations around the world.